Forged Steel Sockets thru 38mm, cast alloy steel 40 mm thru 100mm. Spelter socket terminations have an efficiency rating of 100%, based on the catalog strength of wire rope. 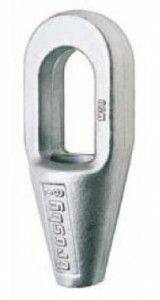 Ratings are based on recommended use with 6 x 7, 6 x 19, or 6 x 36, IPS or XIP (EIP), XXIP (EEIP), RRL, FC, or IWRC wire rope. NOTICE: All cast steel sockets 40mm and larger are magnetic particle inspected and ultrasonic inspected. Proof testing available on special order. Drawing illustrates one groove used on sockets 6mm thru 19mm. Sizes 22mm thru 38mm use 2 grooves. Sizes 40mm and larger use 3 grooves. 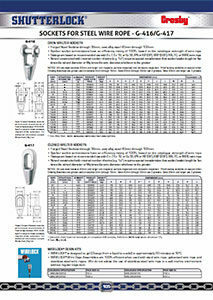 Spelter socket terminations have an efficiency rating of 100%, based on the catalog strength of wire rope. 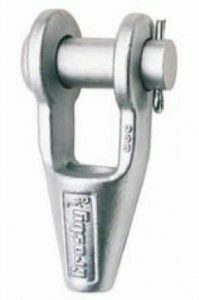 Ratings are based on the recommended use with 6 x 7, 6 x 19 or 6 x 36, IPS or XIP (EIP), XXIP (EEIP), RRL, FC or IWRC wire rope. NOTICE: All cast steel sockets 40 mm and larger are magnetic particle inspected and ultrasonic inspected. Proof testing available on special order. Drawing illustrates one groove used on sockets 6 mm thru 19 mm. Sizes 22 mm thru 38 mm use 2 grooves. Sizes 40 mm and larger use 3 grooves. 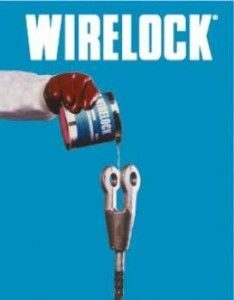 WIRELOCK® Wire Rope Assemblies are 100% efficient when used with steel wire rope, galvanized wire ropes and stainless steel wire ropes. We do not advise the use of stainless steel wire rope in a salt water marine environment without regular inspection.